Pizza. It’s the perfect meal for lunch, dinner, and even breakfast. And did you know The Henry B is situated in its own little slice of pizza heaven? 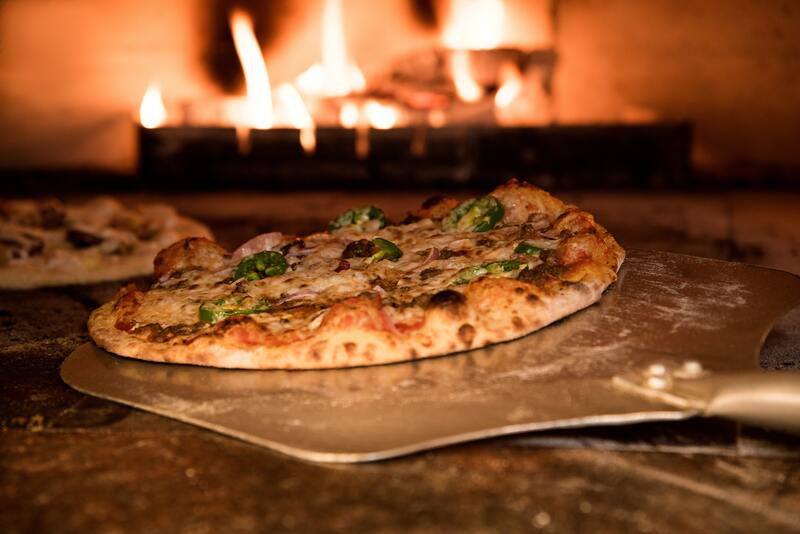 Yup, northwest San Antonio apartments have ample access to a range of pizza joints. From the traditional chains to local mom and pop shops this neighborhood has its fair share of pizza options. To help you narrow down your options next time you’re craving a slice we’re highlighting a few local spots to grab a quick slice or pick up a pie. The tricky thing with ordering pizza for a group is deciding on which toppings to order. 1000 Degrees makes that job a little bit easier. This place serves up personal pizzas so everyone can order exactly what they want. It’s set up similar to a Subway or Chipotle where you can pick a base and customize the order as you go along. Pick from a wide range of sauces, toppings, and even doughs. If you’re feeling adventurous, you can even add mac and cheese as a topping! The pizza is made with a thin crust and cooks at, you guessed it, a 1000 degree oven. As a result, you get a crispy crust in almost no time! For no-frills, classic New York style pizza head on over to Maria’s. This locally owned shop serves up traditional pizza, subs, and calzones. Everything here is made from scratch, so even if you’re not a fan of crusts, this place might make you think twice. It’s a great place if you’re just looking to pick up a slice for lunch or dinner to bring back to northwest San Antonio apartments. Plus the owners couldn’t be sweeter! Prefer Chicago over New York style pizza? If so you know that it can sometimes be a bit difficult to find quality deep dish pizza here in Texas. Amigo’s Chicago Pizza lives up to their namesake and dishes up some tasty deep dish. Guests love their meat lover’s pizza. In addition to the classic takes on pizza Amigo’s also has several Indian-inspired specialty pies like the tandoori chicken pizza. Mouthwatering from all these pizza options? We know ours are just from writing this! For now, we’d like to take a second to thank those of you who took time out of your busy schedules this blog from The Henry B. We loved writing this, and we hope you enjoy reading more of our blogs! Be sure to check back in a few weeks to read our next post when it goes live on the site. In the time between now and when our next blog goes live, be sure to check out some of the awesome nearby pizza restaurants.